How Does Sri Yantra Work ? Sri yantra repeats the form of the double triangle, enclosed in a lotus within four walls. it is the symbol of Sri Devi in two forms, Her own form and the form of the universe. These two forms represent the inner spiritual and the outer external worlds. 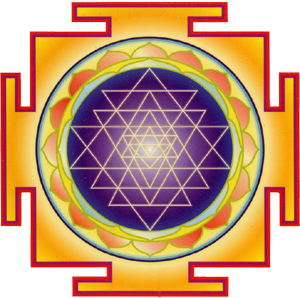 The highest ultimate object of meditation on this yantra is to ultimately rediscover who you really am on a soul level. Have you stopped and asked yourself ‘Who am I ?’ ‘why am i here?’ How is your soul connected with the Supreme Soul? Sri or Laxmi may guide you towards liberation but the actual choice of your path would be determined by the strength of your own unique sukriti or spiritual merits. These are accumulated over many lifetimes. If you feel bereft of such merits, or just don’t know then this yantra is a wonderful tool along with its mantra, to begin the process of spiritual expansion. Align your mind and heart to higher spiritual vibrations of Sri yantra and expand your spiritual bank account. The journey to our ‘centre’ or the spiritual aspiration is represented by the dot or bindu in the centre of Sri Yantra. For the most of us, we are perhaps not so attuned to our ‘higher self’ or our spiritual nature at all times. We mostly identify ourselves with our bodies and for this reason we want to enjoy opulences of this world through the senses of the body. So what do you need? What do you want? Good finances, wealth, power, fame and to be surrounded by beauty and luxury? These things are very easily given by Sri Laxmi devi. Your sincere and honest approach to Her by meditating upon Sri Yantra can make your dreams come true, and there is an opportunity to become empowered and distinguished within your status quo. During installation of Sri Yantra we are in effect calling or invoking the Goddess with her mantra and asking her to transform your consciousness by displacing our negative traits with our personal positive affirmations. We can express certain ideas and qualities in our life, that we may want to attain or transform. At first the yantra appears merely as lines, corners and petals, but with the practise of the mantra meditations and techniques, we may have inspirational realisations or experience an euphoria for a few moments even. Some of us will feel nothing tangible immediately and some perhaps witness the external manifestation of something desired. The process requires perseverance, faith and patience and is totally unique for everyone. Filed Under: History, Science and Practice, Uncategorized, Vastu / Feng-Shui tools, Vastu and Finance, Vastu and Health & Well-being, Vastu and Relationships, Vastu and Spirituality, Vastu and Wealth, Vastu in the Home, Vastu in the Workplace Tagged With: abundance, beauty, chant mantras, distinguished, empowered, fame, Feng Shui, Goddess, harmony, health, higher self, Improved finances, liberation, lifetimes, luxury, mantra, meditation, Meru Chakra, positive affirmations, positive energy, power, remedial solutions, spiritual bank account, spiritual merits., spiritual vibrations, sri laxmi devi, Sri Yantra, strength, sukriti, Supreme Soul, transform consciousness, transformation, vastu consultation, vastu sacred mantras, wealth, Yantra, yantra installation., your status quo.